JAMMU, May 10: President Ram Nath Kovind said today that borders of the country are fully safe and secure because of the brave troops and that the people sleep fearlessly at the nights knowing that the Army personnel are awake and ever vigilant. Kovind, who today became only the second President after Dr APJ Abdul Kalam to visit Siachen Glacier, the highest battlefield in the world in Ladakh region of Jammu and Kashmir, tweeted: “your (the Army troops’) bravery and valour have given every Indian the confidence that our borders are safe and secure. Every Indian is grateful to you and stand by you and your families”. Army chief Gen Bipin Rawat and Northern Command chief Lt Gen Devraj Anbu accompanied the President to Siachen Glacier. Describing the troops are nation’s pride and sentinels of our liberty, the President said the citizens (of this country) sleep securely knowing you are awake and ever vigilant. “As Supreme Commander of the Armed Forces, I’m immensely proud of our soldiers. Every Indian is grateful to you”. 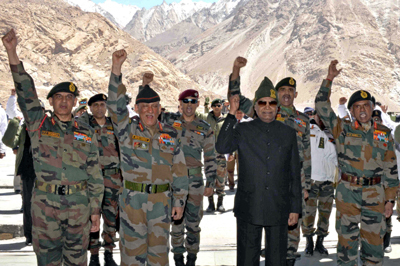 Kovind, who became first President to visit Siachen Glacier in last 14 years as Dr Kalam had visited the highest battlefield in 2004, said the way the Army was bravely manning Siachen during past 34 years, has given confidence to the people of the country that the borders are fully safe and secure because of them. “Your integrity to protect the motherland is an ideal for all the countrymen. The feelings of sacrifice you have for the countrymen are worth praising. The more we praise your feelings, the less it would be. I have come here to further boost your morale,” the President, who also happens to be the Supreme Commander of all three forces including Army, Air Force and Navy, said in his address to the troops. Noting that Indian Army had entered Siachen in April 1984 under ‘Operation Meghdoot’, Kovind said during last 34 years, the brave jawans of Army haven’t allowed the enemy to even touch this land. “You have been facing extreme difficulties to keep tricolor fly high at such a height. Many Army soldiers have given their sacrifices for this. I salute all such brave Siachen Warriors,” Kovind said through another tweet. Asserting that he was feeling immense pleasure by meeting them (the Army personnel) in Siachen Glacier, the every Indian citizen has very high respect towards the Army personnel and officials, who have been guarding the country’s borders. He said he wanted to convey this feeling of the countrymen to the Army jawans at Siachen. “Siachen is the world’s highest battlefield and it is difficult to lead even a normal life in such extreme climate. In such a situation, your determination and dedication is worthy of the highest praised. As the supreme Commander of our Armed Forces and as the President of India, I have come here to convey the gratitude of the entire nation to you,” Kovind said. He extended an open invited to the troops deployed in Siachen Glacier to visit Rashtrapati Bhavan whenever they come to New Delhi. “You are welcome to Rashtrapati Bhawan,” he said addressing the jawans. The President also visited the Kumar Post. After arriving at Thoise airfield, the President flew to Siachen and undertook an aerial survey of the Glacier, the spokesman said. The President also paid his respects at the Siachen war memorial, a symbol of the sacrifice of 11,000 soldiers and officers who had been killed since the Indian Army began `Operation Meghdoot’ on the Siachen Glacier on April 13, 1984. Some of the posts on Siachen were located at an altitude of more than 20,000 feet where the temperature dropped up to minus 52 degrees Celsius, making it the toughest war field for the soldiers guarding it.